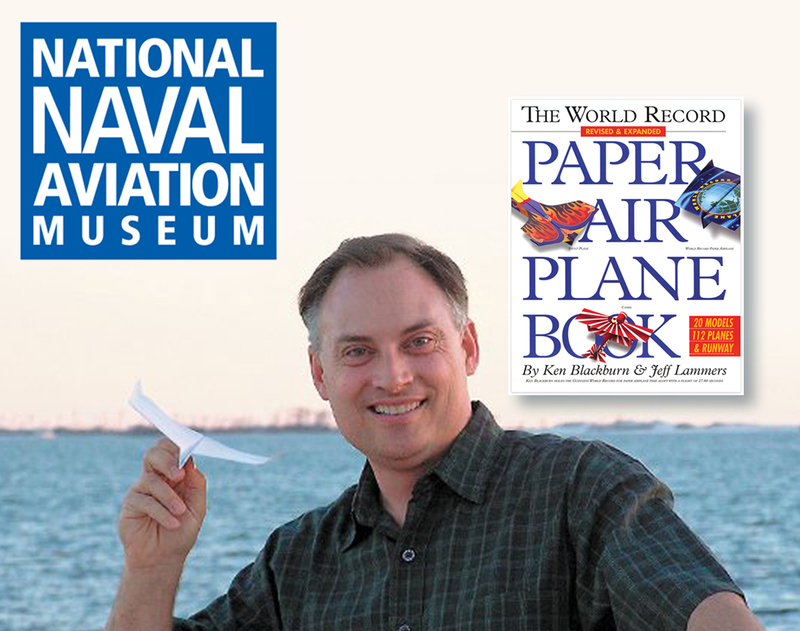 Saturday, May 21 at 10 a.m.
May 5, 2016 –Pensacola, Fl—Discovery Saturday attendees will have the opportunity to see Ken Blackburn, a paper airplane champion, demonstrate his record-breaking plane design. As part of its mission to inspire and educate, the Naval Aviation Museum Foundation will present the program at 10 a.m. on Saturday, May 21, in the Blue Angels Atrium of the National Naval Aviation Museum. Blackburn graduated North Carolina State University second in his class with a BS in Aeronautical Engineering. He worked for McDonnell Douglas in St. Louis in fighter aircraft fuel system research. A few years later he switched to the aerodynamics department in the Phantom Works, who later merged with Boeing. In 2004 Blackburn left his job with Boeing to work for Jacobs Engineering at Eglin Air Force Base, performing research on small, unmanned air vehicles. Blackburn currently works for the Air Force Research Lab as a government employee working on advancing aerodynamic technologies. “Discovery Saturday” events are FREE and open to the public. The National Naval Aviation Museum features FREE admission and a full slate of events throughout the year. For a complete list of events, exhibits and attractions at the Museum, visit NavalAviationMuseum.org or call the Naval Aviation Museum Foundation at (850) 453-2389 or (800) 327-5002.